Most UK orders are sent via courier on a 3-5 working day trackable service. We aim to dispatch all orders within two working days. If you need your item sooner we can dispatch via a next day courier service for an additional fee. Please contact us asap to discuss and we will do our best to accomodate your needs. We can also offer same day delivery on some items to addresses located within travel zones 1 and 2. Please contact us asap to discuss your needs! FREE UK DELIVERY is available on all orders over £30 if the discount code FREE is entered at the check-out stage of your order. If you need an item sooner we can dispatch via a next day courier service. There would be an additional charge for this service payable by the customer. 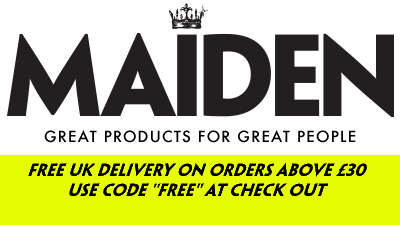 Please telephone us on +44 (0)20 7998 0185 or e mail info@maidenshop.com to discuss your delivery needs and we will do our best to accomodate your needs. We use Royal Mail’s Airmail service for most international orders, some larger items are sent by a different courier. There is no tracking available on the Airmail service that we use. If you require a trackable service for your order please e mail info@maidenshop.com and we will advise you of the extra cost involved. We aim to dispatch all international orders 48 hours after they are received. Please allow at least TEN working days for international orders to be delivered. We can send international orders by a faster method such as UPS, Fedex or DHL, but there will be an additional cost for this method which is payable by the customer. Please e mail info@maidenshop.com or telephone +44 207 998 0185 to discuss this further. Please note that we do NOT offer free delivery on international orders. The FREE discount code can only be used on orders being sent to an address within the United Kingdom. If you wish to cancel an order before it has been dispatched please send an e mail to info@maidenshop.com as quickly as possible and we will cancel the order for you. If the goods have already been dispatched they can still be returned under the terms of our returns policy. If you wish to return any item that you have purchased online you can do so up to 28 days after you have received the goods. All items must be returned in their original condition with their original packaging (where applicable). We advise you to use a trackable form of postage when returning items to us. Once we have received your returned item, your credit or debit card will be refunded for the items, less any original delivery costs incurred by Maiden at time of order dispatch. Refunds will normally be processed within 5 working days of Maiden receiving the returned item. Our Returns policy is in addition to (and does not affect) your statutory rights. If an item or product arrives faulty, please contact us immediately and we will help you to resolve any problems. The measurements listed online are approximate and there may occasionally be small variations between the measurements listed online and the measurement of the item you receive. We aim to ensure that all stock levels listed online are accurate; however, there may occasionally be a discrepancy between stock listed online and our physical stock. In the unlikely event that you order an item online which we do not have physical stock of we will refund your money immediately and contact you to let you know when the item will be back in stock.